A recent blog published in the Chronicle of Higher Education (U.S.) has put the spotlight on cloud computing as part of the strategy to build university-wide collections of research papers. Over the last year, cloud computing has not only found fertile ground in the commercial sector but also gained increasing interest in government and eScience. The notion of a simple interface to acquire dynamically provisioned computing resources has taken root in all sectors with SMEs among the primary beneficiaries. We have also witnessed the emergence of a number of national cloud initiatives aimed at reducing IT costs, lower energy costs, gain greater flexibility and drive innovation. What’s new on the Digital Library front? Cloud computing may be a viable solution when it comes to providing off-site storage for data as institutional repositories are set up to provide free on-line collections of papers by researchers in their respective institutions. DuraCloud is a new project where developers are building software to facilitate librarians in putting repositories in off-site data storage services. The main advantage lies in having storage providers take care of the basics of pure storage and in saving on costs. The project, which is funded by the Andrew W. Mellon Foundation and spearheaded by DuraSpace, is currently in a pilot phase but developers are planning to release a version to share with other librarians later this year. Of course, the idea is to provide more than just storage, with the ultimate goal of offering services that support libraries in terms of access, preservation, re-use and sharing. Current impediments to the wider adoption of cloud computing span data handling, security and privacy, as well as with regard to the legal and policy framework. 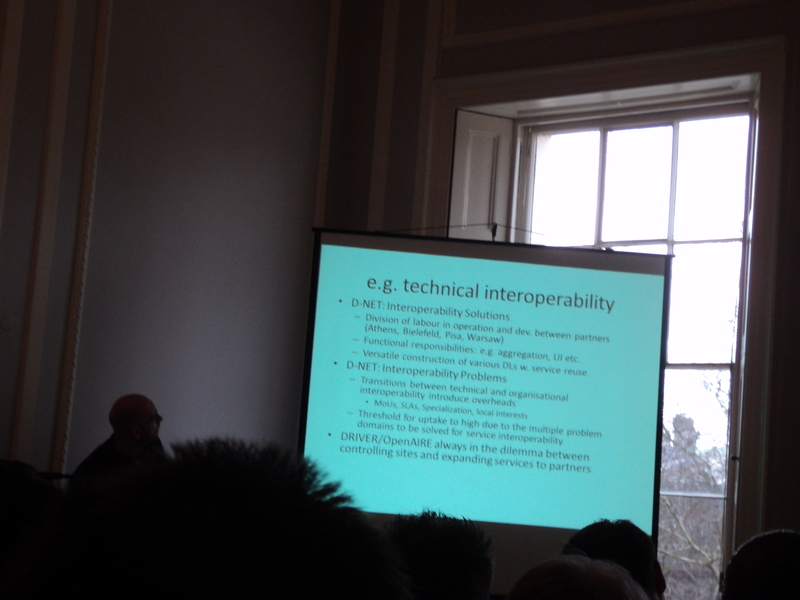 Interoperability is also a top-level challenge. Last year also saw a positive approach on the standards front as several standards development organisations working on cloud computing specifications came together to ensure a more co-ordinated approach that will help bring a complementary standards framework (The Cloud Standards wiki has been created to put everyone on the same page). Governments involvement in cloud computing could also shape these developments and foster open standards. From a European and global perspective, OGF-Europe has spearheaded the establishment of a Research Group on Digital Repositories within the Open Grid Forum (OGF) co-chaired by two Europeans – Andreas Aschenbrenner from Goettingen University and Nicholas Ferguson from OGF.eeig the technical co-ordinating partner of OGF-Europe. The Group has connected the distributed computing, curation and repository communities to work towards an architecture study and collection of metadata use cases. The ultimate goal is to understand how current and emerging standards can bring about interoperability. Experts in the field believe that exploring the commonalities in different architectures and metadata handling could be a major push to the interoperability of digital repositories and ease their exploitation in distributed computing environments. DuraSpace is a group formed last year by a merger of two groups that produce software to manage digital repositories—the DSpace Foundation, which started at the Massachusetts Institute of Technology, and Fedora Commons, which began at Cornell University. OGF-Europe is the European Chapter of the Open Grid Forum funded by the European Commission and aligned with OGF’s mission of fostering the pervasive adoption of distributed computing for innovation in enterprise and science through open standards while ensuring Europe gains a stronger, collective voice in the distributed computing arena.